Posted by iebailie in Travel Log. For our last free weekend I decided it would be a good idea to actually get out of Spain for a bit. Not that the country isn’t amazing (it most certainly is! ), I had just come to realization I was already across the ocean and should try and see a little bit more of the continent. And was this a great decision! Unfortunately for the penny-pincher, the cheapest flights leave at the crack of dawn, making it rather hard to get to the airport. Fortunately, a shuttle bus, which is part of the Madrid public transportation system, caters to the early-birds. So, at 3 in the morning, we trekked to the bus stop and were off. I won’t bore you with flight details (other than the fact I couldn’t resist a delicious, if overpriced, chocolate muffin on the plane), but by 8 a.m. we were walking out of the Lisbon airport and into a great weekend. See what I mean? 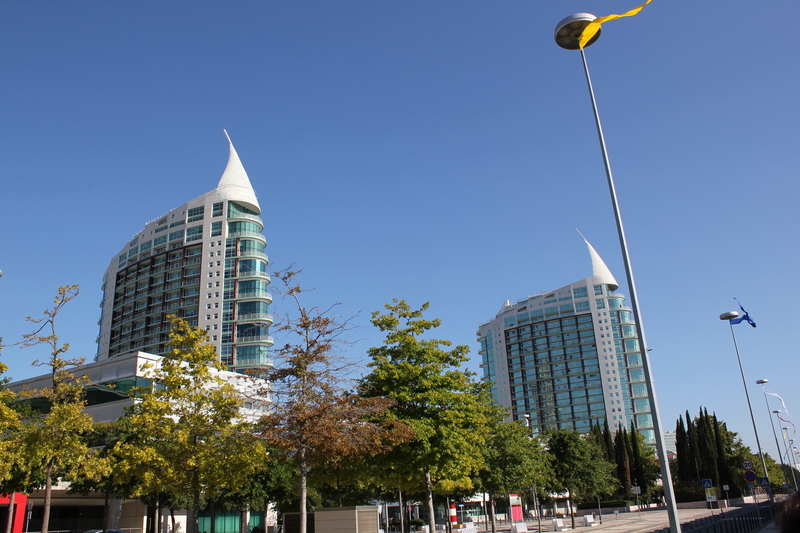 Lisbon is definitely modern, at least in part. the terminal to the waterfront, a 5-ish mile jaunt. It great to see “real” Lisbon on our way down to the bay and have uninterrupted sidewalks the entire way! When we finally reached the water, we were in one of the newest parts of the city, and it showed! Modern glass-clad complexes filled the neighborhood, including a rather upscale mall with one of the coolest roofs I’ve ever seen; it was glass, but had water flowing over it. The shining jewel, though, was the area flanking the water. Along about 3 miles of the coast, sidewalks, little cafes and an incredible park ran. In the park, you move from one segment to another, one feeling like a jungle, another like the desert, and another like the backyard of an Italian villa. It was amazing! 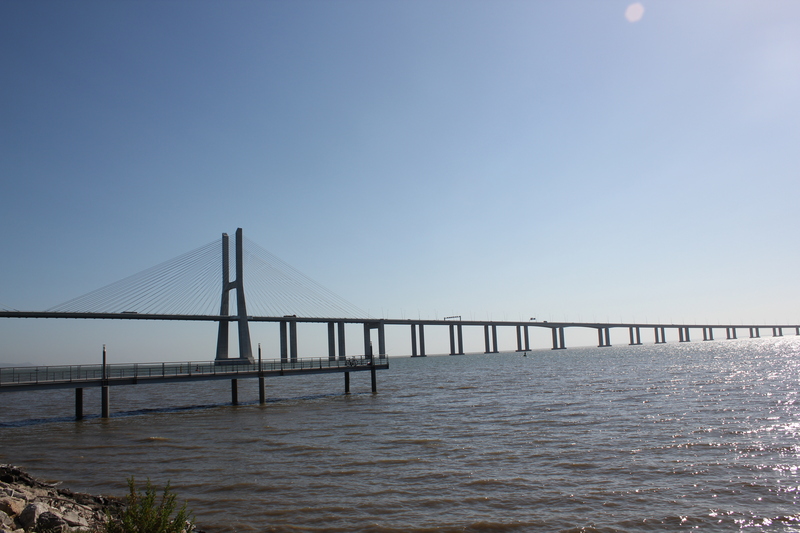 And, all of this led to the gorgeous Vasco da Gama suspension bridge. Needless to say, I was not expecting any of this from Lisbon! would be a nice little half-hour walk turned into an almost-two-hour hike! Fortunately, the scenery provided some entertainment. 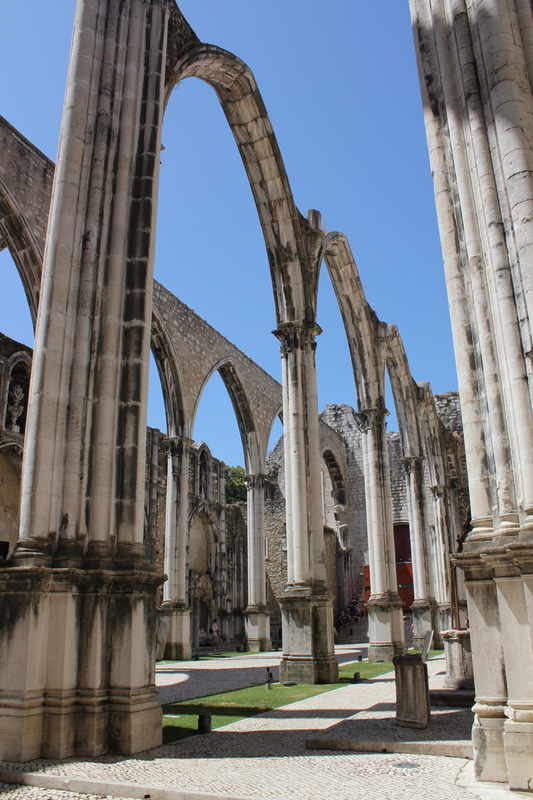 Anyway, after an exhausting walk, we reached another historic district in the city, Belem. Not only did we see the impressive gothic-style monastery, we marveled at the Monument of the Discoveries (in the New World, of course). By this point we were absolutely spent and took a train back to our hostel. from past excavations on display, and Egyptian and South American mummies sat in their cases flanked by floor to ceiling shelves containing old books, like the 10 volume 18th century census of Lisbon! I was certainly impressed. After a quick lunch we hiked up to the Castle of San Jorge de Lisboa. 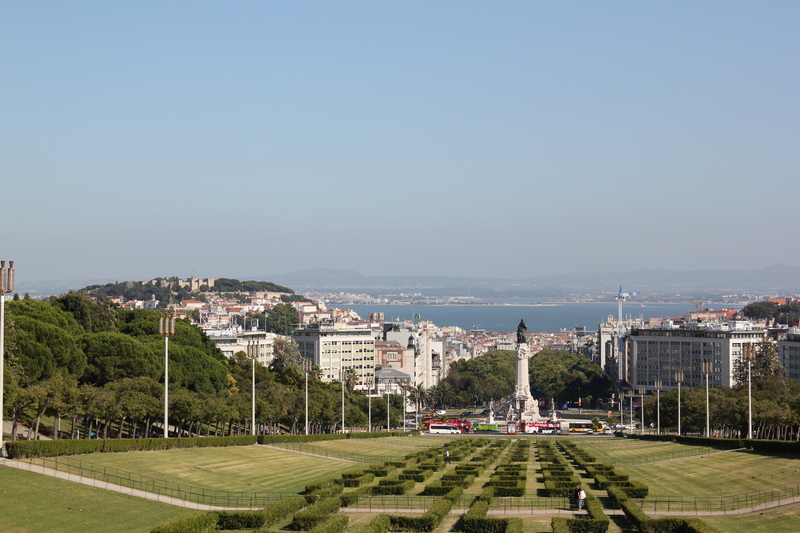 The complex sits atop one of the tallest hills in the city, making for great views of the valley and bay, and even the Christ statue that faces Lisbon from across the water. The castle itself was definitely cool, although it was no match for the views of the city. We seriously spent 2 hours just looking at the city! A couple minutes later, we were standing in el Parque Eduardo VII. From the dual columned monument at its center, to the manicured, geometric shrubs, everything was planned and planned well! After a quick stop at El Corte Ingles (the only one in Lisbon!) we headed further downtown in search of dinner. Here's the park. The views from here were even good! I am sorry to say we stopped at the Hard Rock Cafe, but Kristina needed a t-shirt and we were famished; after walking all day, who wouldn’t be hungry? We had one of the greatest waitresses ever and a good time was had by all. We left sated and metroed it back to the hostel where we all had an early night in preparation for our ridiculously early flight back to Madrid the next morning. I was definitely sad to be going. 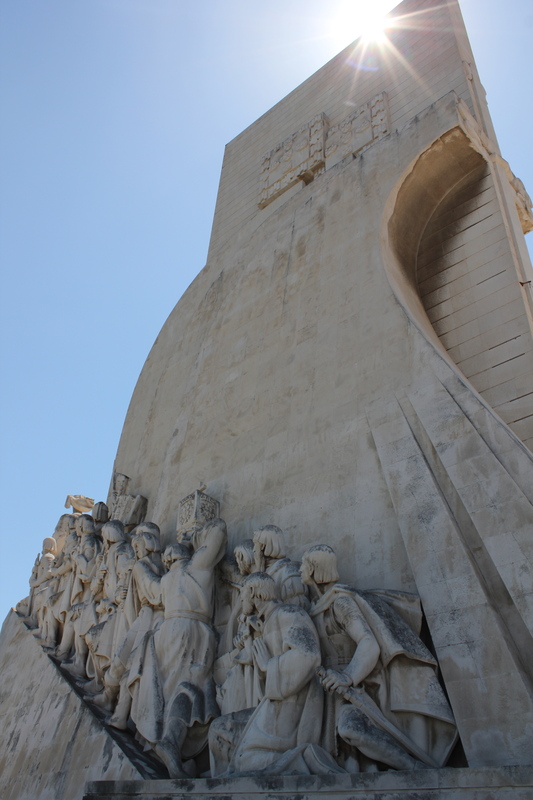 Lisbon is an amazing city, I saw great things, and (surprisingly) didn’t spend all that much money! I can honestly say I will make a point to go back when I can. 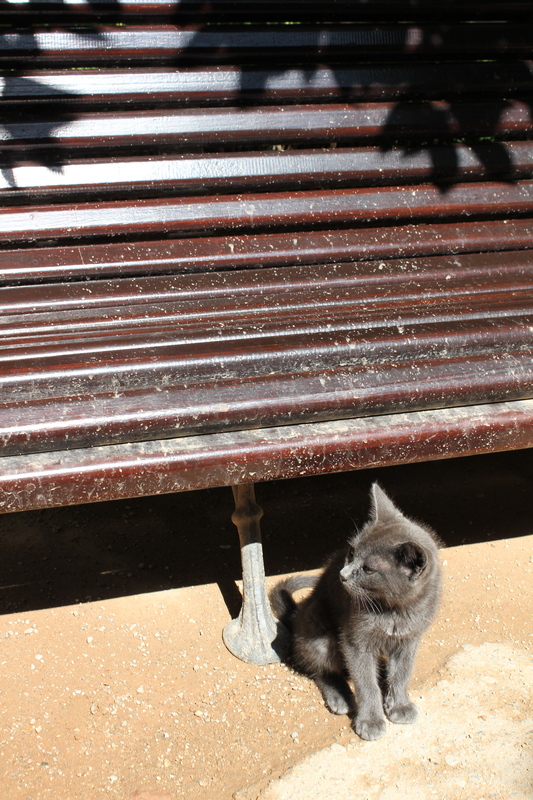 There were even kittens in la Alhambra! Granada – Spanish for pomegranate. 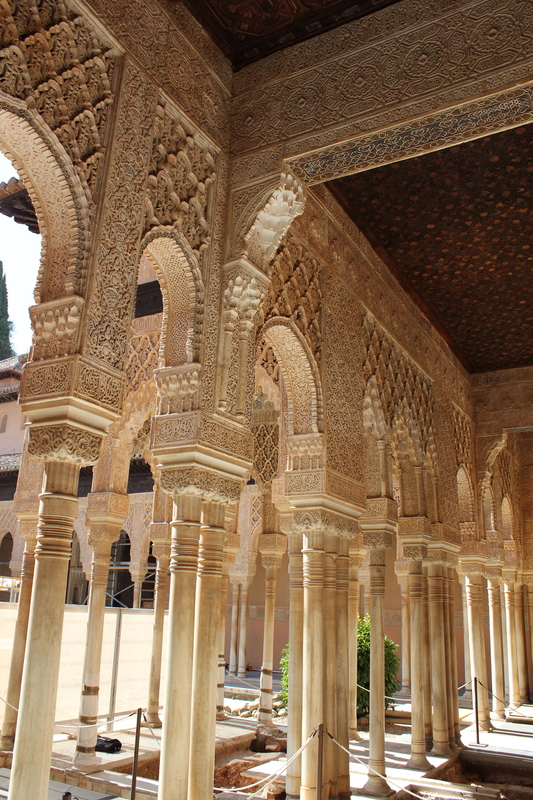 Also, home to La Alhambra and some fantastic Flamenco. We arrived in Granada on the first day in the afternoon with a bunch to look forward to that night. We left around 9 p.m. on a tour bus with an adorable old frenchman as our guide. He took us around the oldest part of the city with its winding cobblestone streets (built by the Moors when they occupied the city). The best part, though, was seeing La Alhambra at night; looking over the valley between us and the palatial complex with every tower and rampart lit under a full moon was simply incredible! Next stop was the Flamenco show. Here's an example of the amazing detail work in the entire complex. It is really a marvel! not easily; one woman had a vicious concentration face that could practically kill. Even the musicians were spectacular. We saw 3 fantastic guitar players and one woman singer who, in addition to singing, danced. Needless to say, we all went home quite satisfied. The next morning, after a very eventful morning of miscommunication and almost leaving some people behind, we were off the La Alhambra. 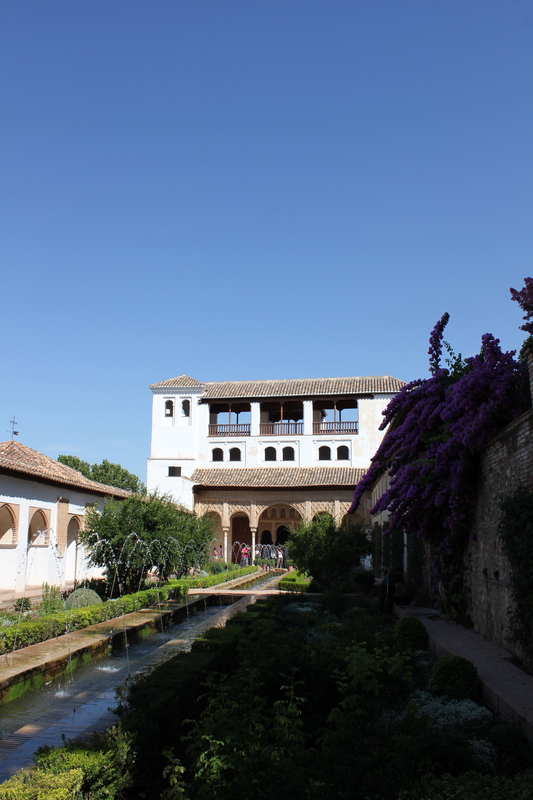 For those who don’t know, La Alhambra is a massive fortified complex including lush gardens and gorgeous Moorish architecture. I can’t adequately describe what the complex looks like, so please peruse the photos below! Here's one of the many, many pools, or estancos, in la Alhambra. They help cool the entire complex. The last two weeks of my Mexico excursion have been a complete blur! 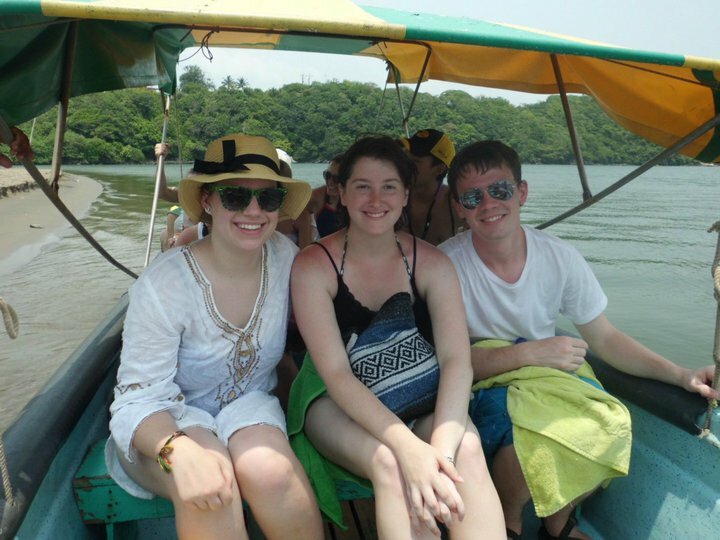 We began our last weekend in the state of Veracruz in a little know eco-tourism location called Sontecomapan. 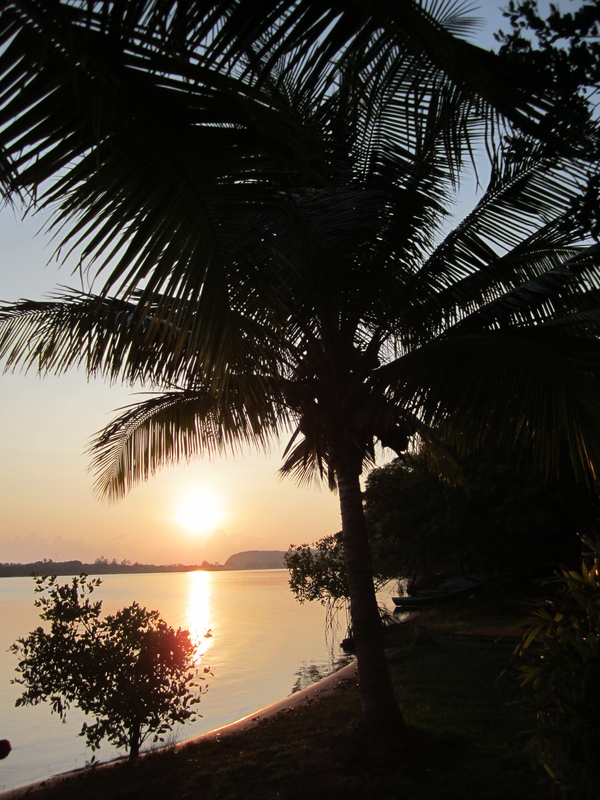 This quaint little settlement used to be a cattle ranch, but now is simply paradise! We got in late on a Thursday night and were greeted by four little cabins, each with their own hammock and a delicious dinner of tostadas topped with locally-caught fish. After a long day on a bus, we couldn’t have asked for more. This was the view from our hill. Be Jealous. We went to the beach. I was soooo very sunburnt! Perceo (the ranch dog) follow, we got to see thousands of tiny fiddler crabs among the roots. Covered in mangrove and swamp mud, we then went and had a delicious fish lunch. And by fish lunch, I mean we all got our own freshly caught fish! After two days of this amazing place, needless to say, we were in for a shock going back to the city and a test and a final project! Trust me, after a long 5 weeks of incredibly hard material, this was a sight for sore eyes! I’ll gloss over the nitty gritty details of the execution of all the studying and project making, but both went swimmingly! What’s more important is the final two days I had in el D.F. After some last minute shopping at Ciudadela (awesome artesanía market; visit! ), we went on a Turibus ride around the city. This is one of the best things to do to cap off an already great trip! We rode around on the roof of a tour bus and saw, summarized every single one of the sites we visited and then some; it was amazing, and surprisingly poignant. From el Angel de la Independencía, commemorating Mexico’s independence from Spain, to la Catedral Metropolitana, it was an unforgettable experience. But, the cherry on top was definitely riding bicycles around the historic district of Mexico on my last day. 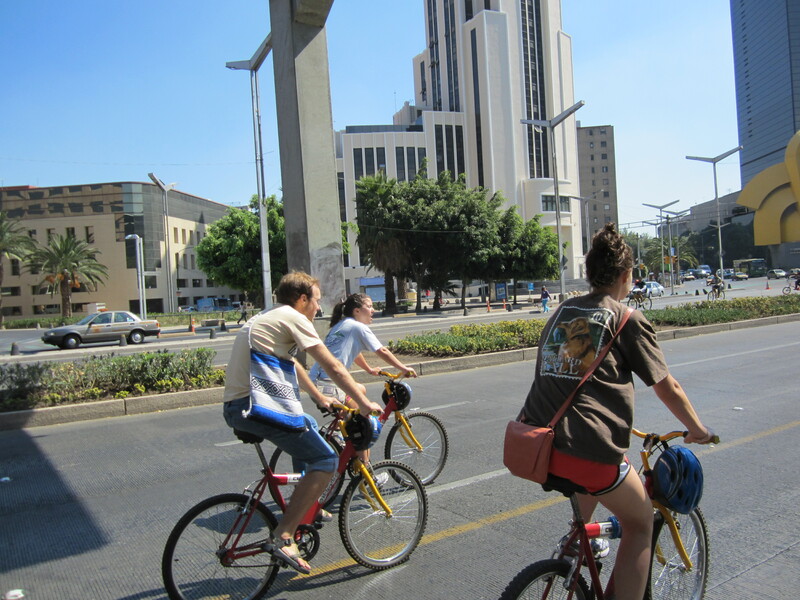 Every Sunday, the city closes off el Paseo de Reforma, one of the most important streets in the city, to allow people to bike and skate up and down the road. So, as a final goodbye of sorts, a small group of us went, rented bicycles and rode for a good 2 hours! This was when I realized I really was going to miss the city. From the little cafes to the incredible (and cheap) panaderías (or bakeries) to the feel of a city that’s one with its residents, Mexico City is simply amazing. And I’m counting down the days till I can go back! Best end to a trip ever. So, it’s been a full month since I’ve come to the D.F. 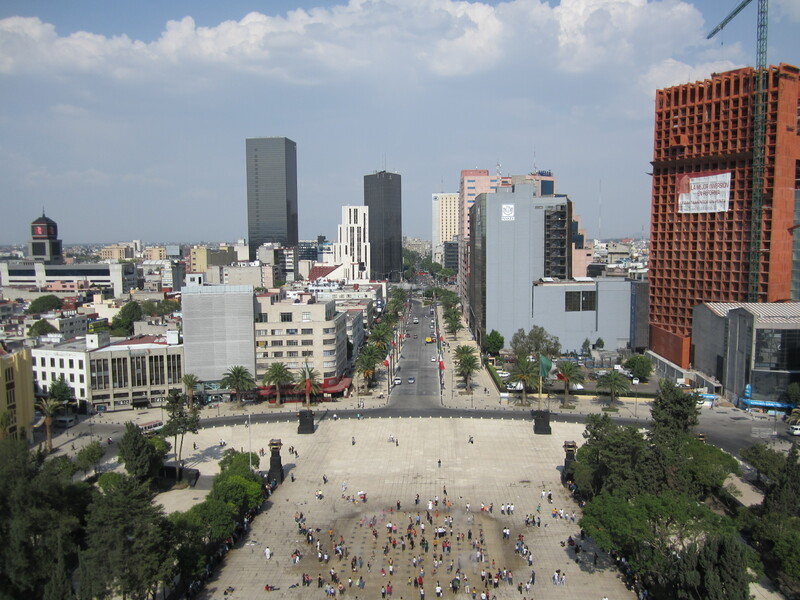 (El Distrito Federal, for Mexico City), and I can’t begin to say how much I love this city! Among some other pretty cool things, we’ve visited a 19th century castle, a 10-story monument to La Revolución Mexicana and have seen more murals than I can count. But, for all you engineers out there, I think you’ll be most interested in our most recent excursion: the Matretta car factory. I’m pretty sure most, if not all of you, have not heard about this car company, so I’ll fill you in. Mastretta is the first and only car company that is 100% Mexican-owned an operated; they even do all their design and production in house! It’s a pretty cool concept too. Any person that orders one of these cars can fully customize the interior to their specifications. Dash too short? Radio in an awkward position? No problem! It’s seriously a custom car for the weekend track-goer. Needless to say, I was salivating over the models they had on show! Most importantly, though, Mastretta is a Mexican company, and a start-up at that. We’ve learned in class how difficult it is to begin a business in Mexico, what with a gargantuan governmental bureaucracy, limited access to credit and stiff outside competition. Here's the monument. The architecture is AMAZING! Other than that very fun trip, we’ve done some exploring on our own. After visiting a beautiful mural by David Alfaro Siqueiros, one of the top three Mexican muralists that were contracted by the Mexican government to teach the history of Mexico to the general population, we literally stumbled across the monument to the Mexican Revolution of 1910. The pictures I’ve put up don’t quite do the monument justice; take a ride up the glass elevator to the top and you’ll understand exactly what I mean! At the top, you get an unforgettable view of the city (and some of it’s smog!) that’s absolutely worth the 30-peso ticket (roughly $2.50). Back on the ground, we witnessed a changing of the guard that surround what appeared to the “the flame” of Mexico. If you’ve ever seen the change guard at the Tomb of the Unknown Soldier, you’ll get exactly what this ceremony was like. This is the fountain at the bottom of the monument. Beautiful, isn't it? But, the most beautiful thing of the monument was the crowd of people simply enjoying the monument and the fountain at its base: this is the Mexico I absolutely love. A couple nights ago after watching X-Men: First Class (it was in English with Spanish subtitles), we got ice cream and just sat in one of the parks in Colonia Roma (the neighborhood I live in). And, even though it was 10 at night, a good portion of the neighborhood was out with their dogs and children enjoying the park. People in this city don’t live in it they live it. It’s a pretty foreign concept to most people from the U.S. who (yes, I am stereotyping a little here) tend to live independently. Think privacy fences, no sidewalks and certainly no gorgeous, and safe, parks in the middle of a sprawling metropolis (more stereotypes here, but it illustrates my point). It’s an aspecto hermosísimo (literally “super beautiful aspect”) of Mexican society that I’m going to miss dearly in the U.S. Anyway, I have to get back to studying for Doctora Galloway’s incredibly difficult tests! ¡Hasta luego! Well, I landed in Mexico City last Saturday and began what has been a whirlwind of a week! I’m currently studying under Doctora Galloway (she’s a pretty amazing person; take her class if you have the option to!) in the Mexico LBAT. Not only am I learning Spanish, I’m learning the culture of Mexico. 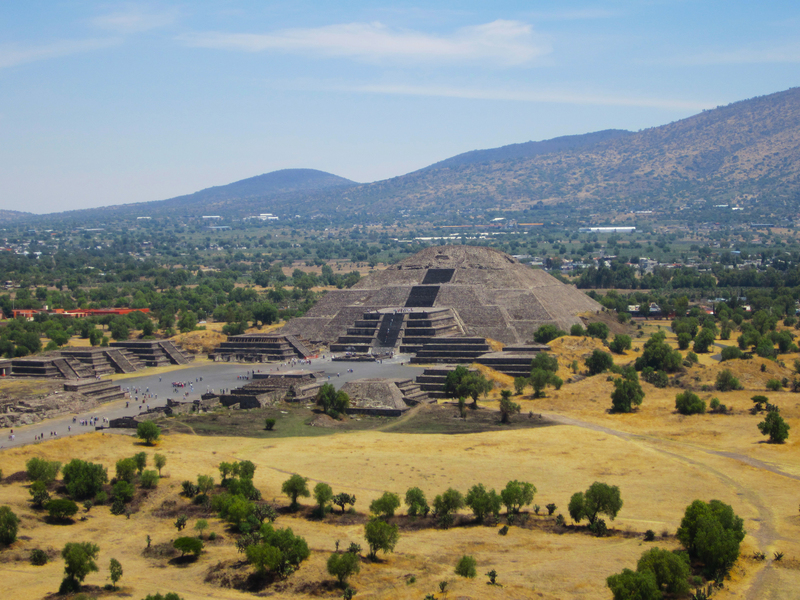 We began by visiting Teotihuacan, where los Teotihuacanos construyeron (built, for you non-Spanish speakers) el Templo del Sol and el Templo de la Luna, two massive pyramids dedicated to the sun and moon. Let me say, it is a long way to the top, but the view is worth every one of the 234 large steps! 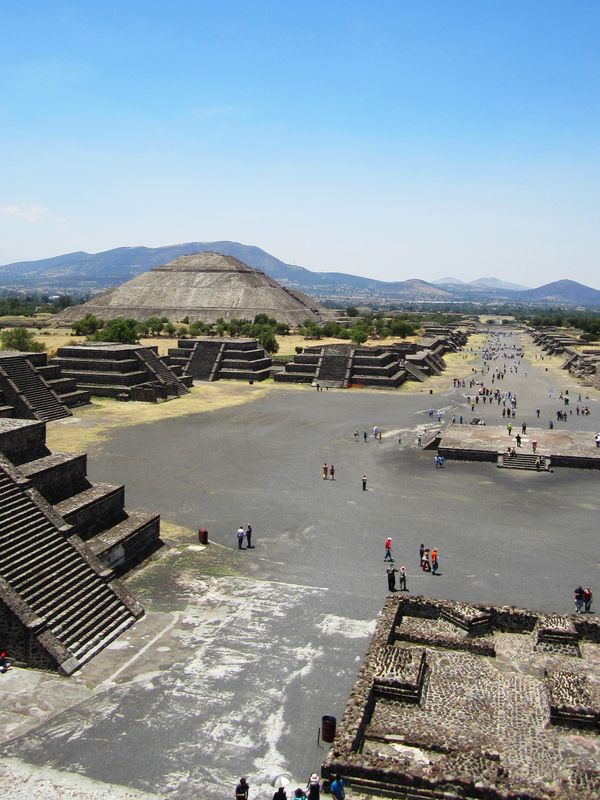 We climbed El Templo de La Luna as well, but only a small part of it was open to the public. To date, I’ve also visited El Templo Mayor (the massive temple that was in the center of Tenochtitlan) and El Museo Antropoligia (one of the best anthropology museums in the world). I’ll keep you posted as we do more! Till then, adios from Mexico!